CROSS AND RESURRECTION - C. N. Bhalerao reminds that the Gospel has been proclaimed in the whole creation. SECURITY IN ETERNITY - There is no reason for a disturbed mind, exhorts M. J. Jacob. WORLDLY TEACHING - Zac Poonen asserts: Material things must have no hold on us. THE GIFT OF A TOMB - Parikshita Shika emphasises: Jesus claims unqualified absolute deity. UNDERSTANDING THE TRIALS OF LIFE - M. G. Mathews exhorts: Our simple minds cannot comprehend God's purposes. 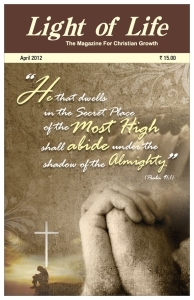 ENCOUNTER WITH THE RISEN CHRIST - Peter S. C. Pothan asks us to experience His power and see the effects. FEED THE HUNGRY - Let our hearts be broken by the things that break the heart of God, exhorts P. Ramanathan. WAR AND PEACE - Shantanu Dutta reminds us to draw close to the light. GOD'S LOVE AND MINE - Vivek Salins reiterates: Anyone who loves is born of God and knows God. GOOD, BETTER AND BEST - Suresh Manoharan encourages: Engage in God-honouring actions. FROM SHAME TO HONOUR - A call by Chacko Thomas to rise above your value systems. NOTES ALONG THE JOURNEY - XXXV - Oby Cherian exhorts: Tell Him about it.